Happy Friday! Thanks to everyone who left me a comment yesterday with their own cooking mishaps. I'm so glad to know that I'm not the only one, and the stories put a smile on my face. Today's card was inspired by this week's Freshly Made Sketch. I decided to flip the sketch so that I could use this flower image from the Love & Sympathy set. That's all I have for you today. Have a fantastic weekend! Sympathy cards are so hard to make and this one is beautiful. Love the color combination. I also purchased this set and need to get it out and make some. Thanks for sharing. This card is simply lovely in every way! I love the Wisteria Wonder with the White - very prettY! This is an absolutely gorgeous card. The Wisteria Wonder really is a wonder because it looks so beautiful on your card. Thanks for joining us at Freshly Made Sketches! Wow, Jen! This is truly stunning. I love everything about it! Every element works perfectly with the rest and makes for a gorgeous card. Thanks for joining us at Freshly Made Sketches this week. Beautiful!! Nice execution & color combination. I like how you made the flowers really *pop*! This is beautiful. Lovely use of the sketch! Beautiful card! Great combination of color, image and sketch, too. This card is so beautiful! Sympathy cards are the hardest to make and you did an awesome job with this one!! I will be featuring this card on My Crafty Picks #35 with a link back to your blog on 9-25-11. Make sure to stop by to check out all the picks and to pick up your Blog Badge to display on your blog for being featured. Absolutely gorgeous! Love the colors and all those wonderful clean lines. TFS. This is stunning Jen, I love how you flipped the sketch and also the use of Wisteria Wonder and all the white...such a pretty card! Thank you for joining us this week at Freshly Made Sketches!!! 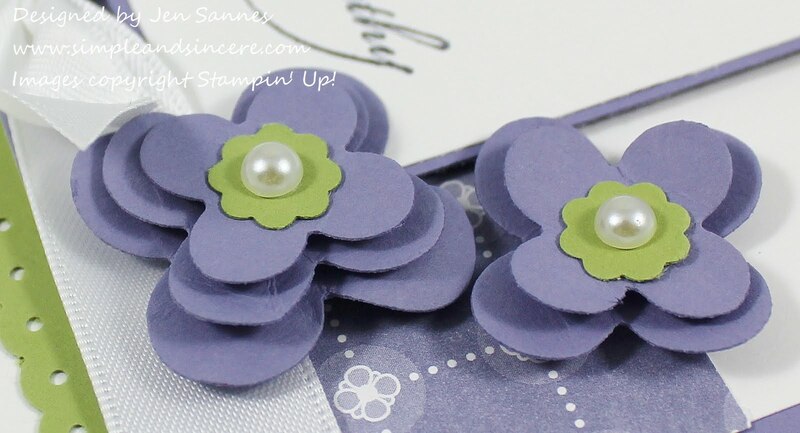 Beautiful and elegant, perfectly suited for a sympathy card. I love thecolors and those fabulous flowers! 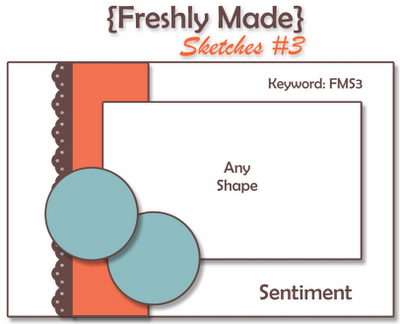 Thank you for playing along with us at Freshly Made Sketches! 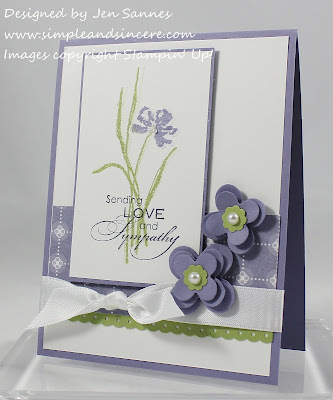 This is gorgeous - I love how you created those 3-D flowers and the sympathy card is beautifully done. I may have to look into getting this set as you have showcased it so beautifully. This card took my breath away. Absolutely gorgeous. I just love this card and I have this set and you gave me some ideas, great job just beautiful! Saw this on Nancy's I picks -- gorgeous! TFS! Love your card; the colors are one of my favorite combinations! So clean and beautiful! Love this colour combo! Beautiful card Jen!! Great job!! WOW!! This is such a beautiful card! TFS! !